We give decision engineers and coaches the processes, tools, and skills that they need to be successful. Our overarching frame is collaborative design and mutual learning. Decision makers need a frame that is broad enough to encompass both “hard” and “soft” science. Our decision science is rooted in the work of Stanford University Professor Ron Howard and his colleagues. Our behavioral science is anchored in the work of Chris Argyris and his colleagues at Harvard University. 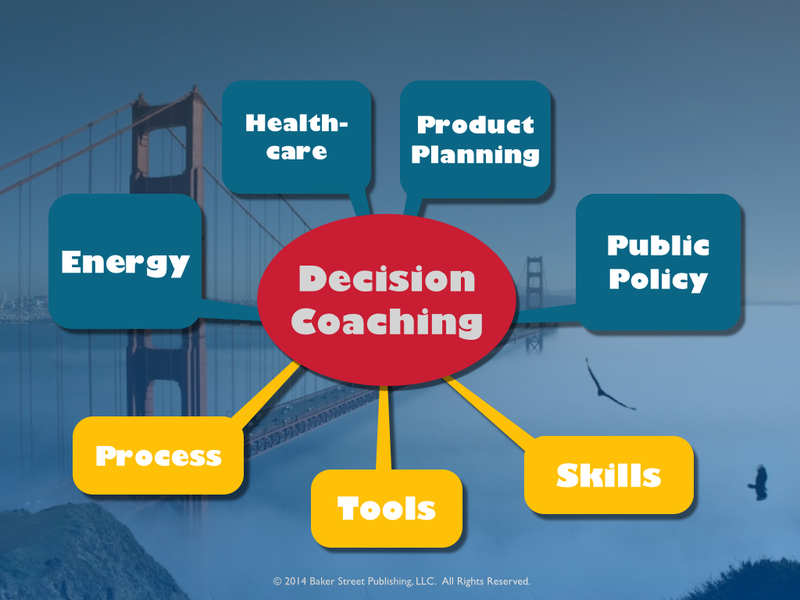 Baker Street Publishing helps organizations by providing decision makers, decision coaches, and decision engineers with the resources that they need to do their work. Our offerings will include all that media technology makes possible, including lectures, presentations, templates, software, training videos, online tutorials, case studies, and digital books. We serve people in business, government, and the not-for-profit sector. We use the Internet to connect with a global community of professionals: decision coaches, decision engineers, management consultants, strategic planners, and facilitators. Our Publisher, Dr. Stephen Barrager, is a pioneer in professional strategic decision coaching. He works with teams in Fortune 500 companies, research institutions, and non-profits. He lectures on organizational decision making and environmental decision making at Stanford University. He is currently writing about decision engineering. Please visit our blogs for news and practical insights about strategic decision making and Transactive Energy. Baker Street Publishing is based in San Francisco and Talloires, France. Please address questions about Baker Street to publisher.bakerstreet@gmail.com. © 2011 Baker Street Publishing, LLC. All Rights Reserved.